Kirsten two weeks after her surgery on vacation in the Bahamas. I am an altruistic donor. I did not and still do not know my recipient. I was given the opportunity to exchange my contact information with my recipient through our transplant teams a few months after donation. With much thought, I decided to give only my information and not ask for hers in return. I would absolutely love to know who received my gift but I know how intimate my own journey was and I did not want to put any pressure on my recipient to get to know me. Oddly enough, I heard a commercial on the radio about becoming a living kidney donor. I had already registered to be an organ donor upon death but had never heard about the possibility to do it while living. The more I researched and learned about being a living kidney donor the easier the decision was to make. For me, it was the type of decision that did not take time to weigh the options for. I truly feel like the universe led me to this decision; it was an idea which quickly turned into an action. My biggest concerns actually came before donation. I was very worried that something would come up and I would not be able to donate after all. At the beginning of my journey, I believed my family and friends were all very supportive. The further into the testing and matching process I got, the more I became aware of the fears my family and friends had. I will never forget the initial meeting I had with the transplant social worker. My mom had come with me, and the social worker asked her how she and my dad were feeling about my decision. My mom replied, sharing that she and my dad support me in this journey, but they wished I wasn’t going through with it. I realized I never asked anyone how they truly felt about my decision. Regardless of their fears, all of my loved ones were extremely supportive in their own ways. 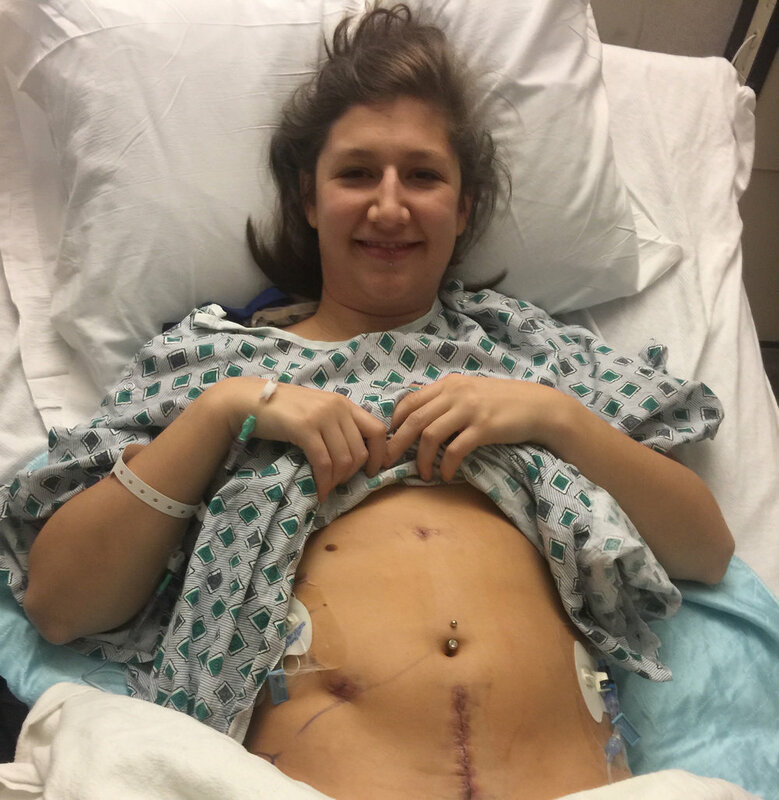 Kirsten, showing off her incision four hours after surgery. My surgery went extremely well. No complications, everything went as planned. Within hours after returning to my room from surgery, I was asking to eat, drink and get out of bed. While I did have one episode of nausea followed by vomiting, I was able to get out of bed and walk the hospital hallways very shortly after surgery. My recovery at home went very smoothly. I stayed with my parents for a few days after the surgery then went back to my home. Although I continually reminded myself to allow myself time to heal, my recovery was much easier than I imagined it would be. For me, the most difficult part of recovery was the emotional piece. I struggled for quite some time with the fact that being an altruistic kidney donor became my sole identity. I was so very proud of the gift I had given, yet I was cautious about telling people. I often felt like people’s views of me changed drastically when they learned that I was a donor. I truly did not realize how my donation would affect my identity and emotions about my relationships with others. I continue to manage this uncharted territory in my life and often find that I speak very nonchalantly about my donation in hopes that people won’t want to talk too much about it. The best way to describe these emotions is a turmoil between humility and pride. Around the same time I decided to donate, I also made the decision to quit my full-time job and engage in my master of social work degree full-time. Knowing I would have a month off for the holidays between semesters, I requested that my donation be scheduled for mid-December. My surgery was scheduled for December 13 and I returned to classes and my internship on January 10. While at the time, it seemed to be a long process, my pre-donation journey was quite quick. In August of 2016 I submitted my first blood work to begin my journey, and four months later I was in the operating room. The biggest surprise I have experienced post donation is that too much of a good thing can be bad. After a few weeks of struggling with passing out, disorientation, memory issues, nausea, fatigue and other symptoms, I learned that I had been drinking too much water. Everything I had read and been told suggested that kidney donors needed to drastically increase their water intake. I never imagined I would drink enough water to get to a level where it could be harmful to me. Unfortunately, it took me getting sick to learn that 3-5 liters of water daily was extremely excessive for me personally. I am surprised to say that I am living proof that you can indeed drink too much water. I would donate again many times over. This year to celebrate my one-year kidneyversary, I signed up to be a possible bone marrow donor.